Leading Manufacturer of edible oil extraction plant from Mumbai. Sparktech is expertise in Edible Oil Extraction Plant to expelling and extraction of oil from various edible and non-edible oil seeds. The edible oil mill machinery (cooking oil mill machinery) consist of various equipment like seed preparatory equipment, seed cooking equipment, oil press also called as oil expellers, filter pumps, plate filter press and other equipment. Various capacities are available for oil milling machinery, which are suitable for small industries as well large ones. 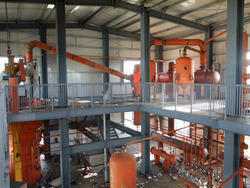 Looking for Edible Oil Extraction Plant ?